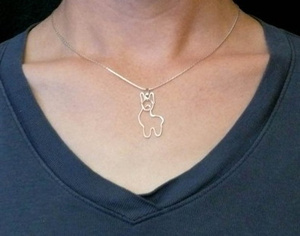 Show your love for Alpaca with an adorable Alpaca pendant made in the USA. You are certain to attract attention wherever you may go with this Alpaca pendant. Measures approximately 1.25 inches x .75 inch and comes with a 16 inch silver plated chain.